Days spent in the outdoors are the heart and soul of a Canadian’s summer and equally, winter! Breathe in the tall trees, admire stunning lakes, share moments amongst majestic peaks, under endless skies, amongst lush greenery, by the ocean or under the stars. Do as Canadians often do and partake in wholesome old fashioned outdoor adventure! The possibilities are endless in one of Canada’s 47 National Parks. Pacific Rim’s expanse of sandy seashore includes our absolute favourite – the classic stretch of Long Beach between Schooner Cove and the headland at the north end of Wickaninnish beach. 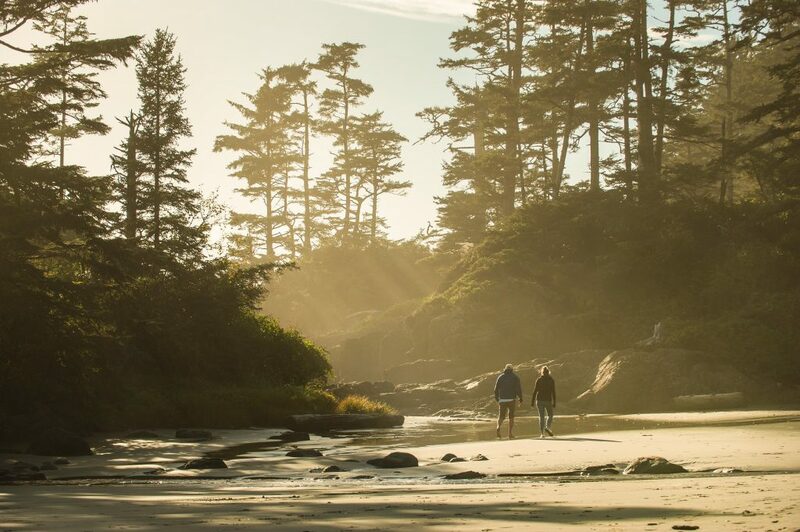 Whether you’re taking an interpretive stroll along the picturesque Wild Pacific Trail near Ucluelet or on a challenging multi-day trek along the West Coast Trail, we can arrange it all. Home to a millennia-old indigenous Nuu-chah-nulth culture and famous for its rugged coastline dotted with endless big surf beaches and old growth rainforest, Pacific Rim National Park is one of Canada’s most breathtaking national parks. Stretching south from the whale watching centre of Tofino, it spans part of Vancouver Island’s wild west coast. One of British Columbia’s largest protected coastal wilderness areas, Tweedsmuir South Provincial Park covers nearly a million hectares of diverse glaciated and mountainous landscapes. Covered in thick boreal forests, it provides an ideal habitat for grizzlies and black bears. A highlight of our Bears of the Pacific Northwest tour, Tweedsmuir will dazzle you with its sheer beauty. Explore coastal trails leading to beaches hidden among sea stacks while soaking up the colourful traditions of Newfoundland’s charming seaside communities. Designated a UNESCO World Heritage Site in 1987, Atlantic Canada’s second largest National Park is a starkly beautiful expanse of mist-shrouded mountains, wind-swept highlands landlocked fjords and lush forests. Ask us about exploring this geological wonder located on the Eastern coast of Newfoundland.